One of the most common things that people want on their web site or blog is a contact form. We’ve got a few tools here that make it easy to build and deploy one. It might be tempting to try and build one on your own, but by using this plugin you get additional features like spam protection, and it spares you writing HTML code. For most purposes, what we’ll show here is going to work perfectly. Go to “Contact::Add New” and let’s start a new form. This will follow the creation of a form we are setting up on the Language Maps, Language Clouds blog here at blogs.shu.edu. Start by giving it a name. 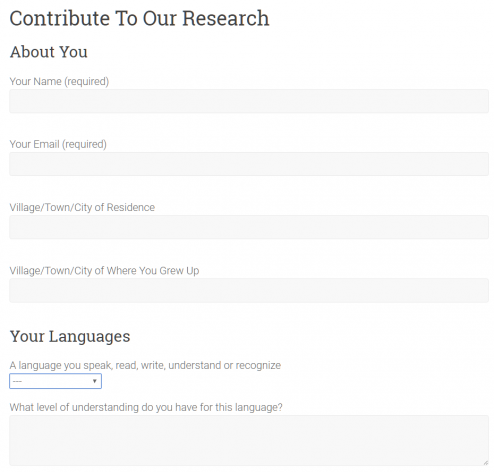 This is going to be called “Contribute To Our Research.” The new form comes with some pre-supplied standard fields that you can use (or not), just like the earlier sample. We want to keep Name and Email. And definitely the “Send” button. But we’ll get rid of everything else. Now let’s create some new fields, using the built-in tools. Contact Form 7 is a very popular plugin, with over a million installations on WordPress blogs worldwide. It’s well-documented and well-supported, with regular updates. There are also some free extensions that led you add functionality like a date picker or a signature field. And another extension which we’ll explain below lets you store form results to a database, and then display them on a page. Start by going to your dashboard, and under “Plugins” find and activate Contact Form 7. You’ll see a new entry in your sidebar for “Contact.” When you hover over it, you’ll get choices for “Contact Forms” (which includes the built-in demo form), “Add New” and “Integration.” We won’t worry about that last one. You can see the usual types of HTML tags. But there are also those sections within square brackets. WordPress calls these “shortcodes.” Different plugins make different shortcodes available, and when the engine finds them it translates them automatically into the required HTML, in this case for form fields. The first word is the type of input. It can be text, or checkboxes or whatever. The second is the name of the field. That’s important later on, when you put together the messages that will go out when a user submits your form. And finally the asterisk makes that field a required field — the user can’t submit the form without filling it in. This seems complicated, and it is. However, the dashboard lets you build the code you need without actually have to type it in. This is the simplest. Just pick the “Text” button, give the field a name. The other settings are optional. If you decide later to make a field mandatory, just put an asterisk next to “text” in the generated code. What do the email (and other) buttons do? If you pick Email, URL, tel or number, it sets the system to do validation to make sure that the user actually enters a proper Email address, URL, telephone or number. An error is displayed if not. The Date button creates a calendar-style date picker, which can be very helpful if you’re collating your responses later. For example if you want to create a dropdown, here’s how you do it. 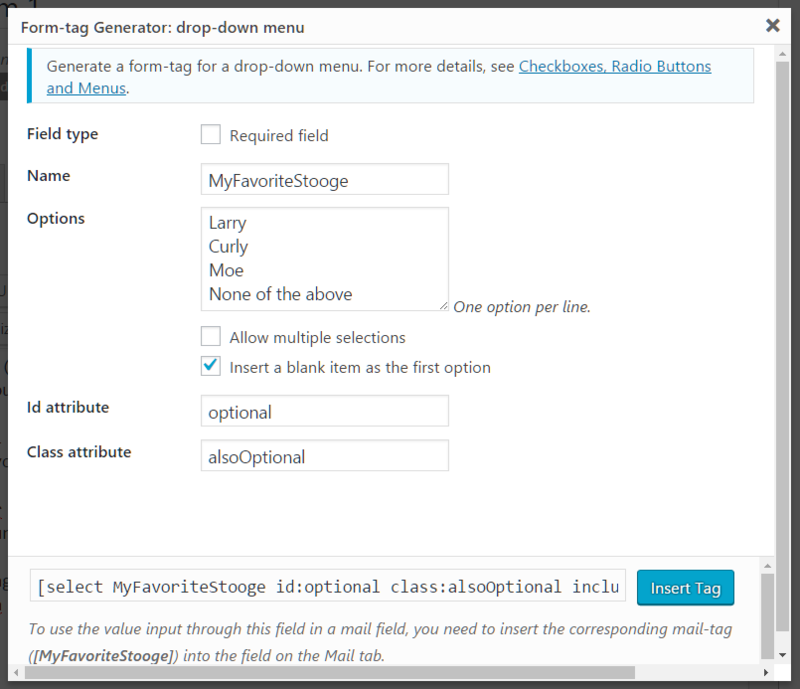 Plant your cursor right after the opening tag, then click the button for “Drop-Down Menu.” You’ll get a popup window where you can build out the details of your dropdown menu. Here are your basic options. First, you can indicate whether to make this a required field. We’ll not do that right now. Then, give the field a name. Make it all letters, numbers and dashes — no spaces. Then your options, one per line. Notice you can let people who aren’t quite decided choose multiples, and you can also put a blank line first so that the first one isn’t selected accidentally. ID and Class attributes are optional, only worry about these if you’re going to go on and make some custom styling or coding. As you build the form, the shortcode is also being built in the box near the bottom. Once you’ve got everything the way you want it, click the Insert Tag button. We’re going to use a list of languages. And we’ll have text entry box underneath, for the level of understanding you have of it. 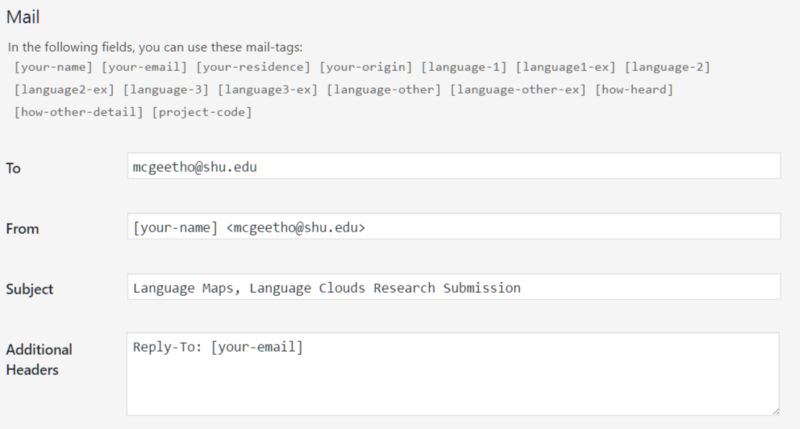 Note that I’ve made these required fields, since everyone should have at least one language. 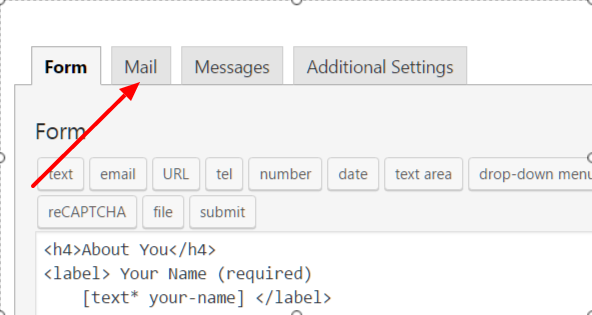 Note: using “<label>” instead of “<p>” is the newer way to do forms. It’s not mandatory, though. But be sure to include to closing tag. include_blank "English" "Spanish" "Italian" "French"
<label> What level of understanding do you have for this language? 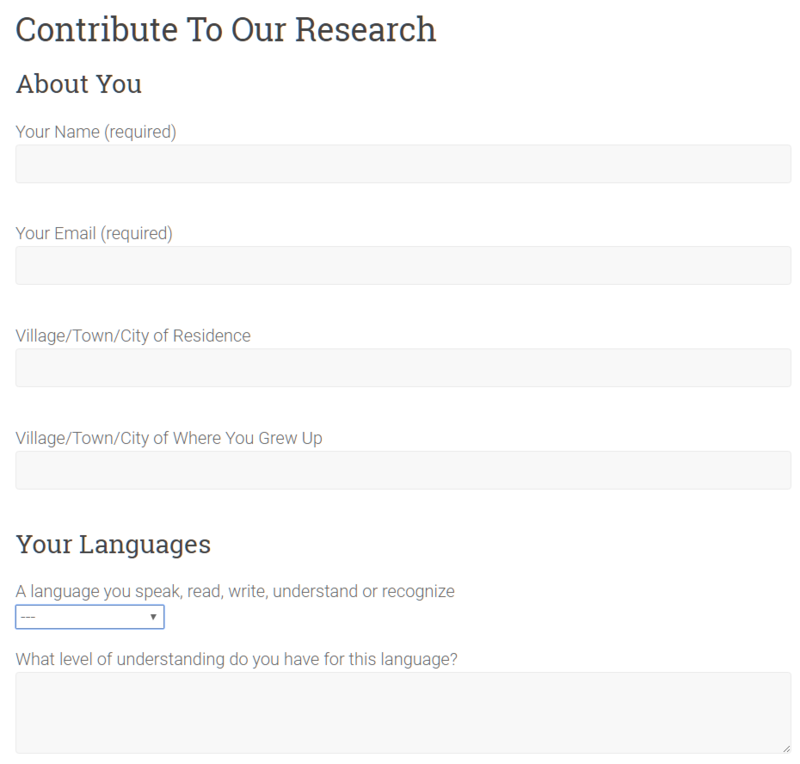 include_blank "English" "Spanish" "Italian" "French" "Tagalog/Filipino"
Radio buttons and checkboxes work much the same as drop-downs. Experiment and see! OK Great, I’ve Got My Form. Now What Happens To The Entries? Excellent question and I’m glad you asked. This is the part where you go into the second tab, the “Mail” tab (right, top). Using angle-brackets around an email address is a helpful convention to know. In the “From” section above, when I look in my inbox that column will show my name in plain text, but the email address is still there and usable. Or code them in HTML, after checking the appropriate box. You can create a second email if you want, for use as a receipt to the original sender, for example. You have to test it out, seriously. It’s amazing how many details can slip through, even if you’ve done it before. If you do have changes, you can just go back into the form edit screen, make your changes and save it. As you can see, the “Second Language” block got smushed in. I’m not exactly sure, but I’ll go back into the “Mail” tab and correct it. Spam is a constant problem, anywhere on the web where you’re asking for user input. Bots, Russian hackers, script kiddies and the like are constantly spreading their good word of cheap pharmaceuticals — using your web site as their billboard. And those are the good cases. In the bad cases, they try to inject code that will compromise your entire server. And almost all of it is automated. The amount of time it would take to individually comment on blog posts or fill in forms by hand would be prohibitive to their business model, which is to blast as many sites as possible in the hopes that some of their message will get through. The point being, don’t try to do it manually; there are experts on the job. As the spam arms race continues, more devious tactics are used to plant spam; and more clever tactics are devised to fight it. We’ve got a couple of good anti-spam plugins already activated that prevent almost all comment spam, and quite a bit of form-reply spam. But you can make your form even safer by using CAPTCHA technology. You’ve seen it frequently — one of those blocks where you check off the box to prove you’re not a robot. Here’s how to incorporate it into your form. You can click on the “reCAPTCHA” button, and it will warn you that you need an API key. This is pretty easy to get, just walk through the instructions on the link given. You’ll get two keys, a “site key” and a “secret key.” Copy-and-paste these somewhere for safekeeping, and then find “Integration” under the “Contact” menu in the left-hand column of your dashboard. You’ll simply paste these two keys into the appropriate spaces, and save. 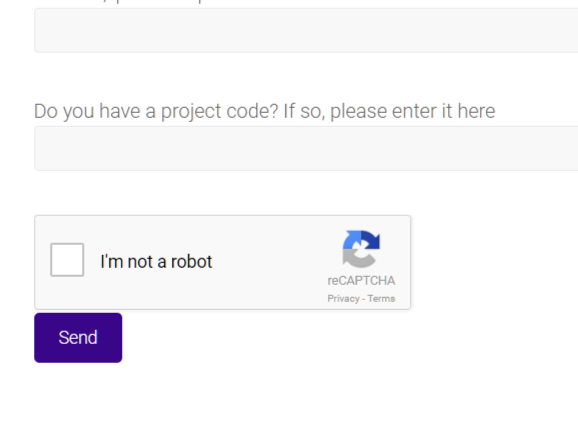 Then go back into your form, put your cursor right above the code for the submit button and click the “reCAPTCHA” button again. Set a few options, and enter it into your form. Save your form. It’s as simple as that. If you’re doing research, collecting registrations for an event, or many other kinds of uses, you’re going to get to the point where you want to see it all at once, preferably in a spreadsheet. For this you use the Contact Form 7 DB plugin. Activate it, and immediately your form responses are stored. From there, you can export them as text or CSV files that you can open into Excel. In the near future you’ll also be able to expert Excel or Open Office format spreadsheets. You can also set up pages to display your data publicly, using the shortcode sets that are provided. Just look at the Contact Form DB Shortcode screen, set your options, and copy-and-paste the shortcode into a page. That’s a lot. But remember, the basic contact form is set up already for you, all you’ve got to do is make sure that the right email address is set to receive the message. The rest? Just an added bonus. Thanks for reading! If you want the results to be viewable without the hassle of exporting and importing text files, you can password-protect the results page.